Quick TR: If you want to skin to Muir right now without taking your skis off, then start from 4th Crossing trail on Paradise Valley Road. I skinned on continuous snow from the road at 4th Crossing (5200 ft) all the way to Camp Muir and up to 10500 ft on Cowlitz Cleaver, and then skied all the way back to the road, without taking my skis off all day. In contrast, it's looking very bare near the Paradise parking lot, not much snow left to ski or skin, plus there are apparently a number of bare sections higher up near Pan Point on the standard route to Muir. Wrong Way? This is most certainly the Right Way, as continuous snow starts about 20 yards beyond that sign. Left the car at 9am, and continuous snow starts within a few yards of the road. Skinned the trail to Mazama Ridge, there are some thin sections near the edge of Mazama Ridge, but a little routefinding still locates 3-4 ft deep continuous snow nearby. 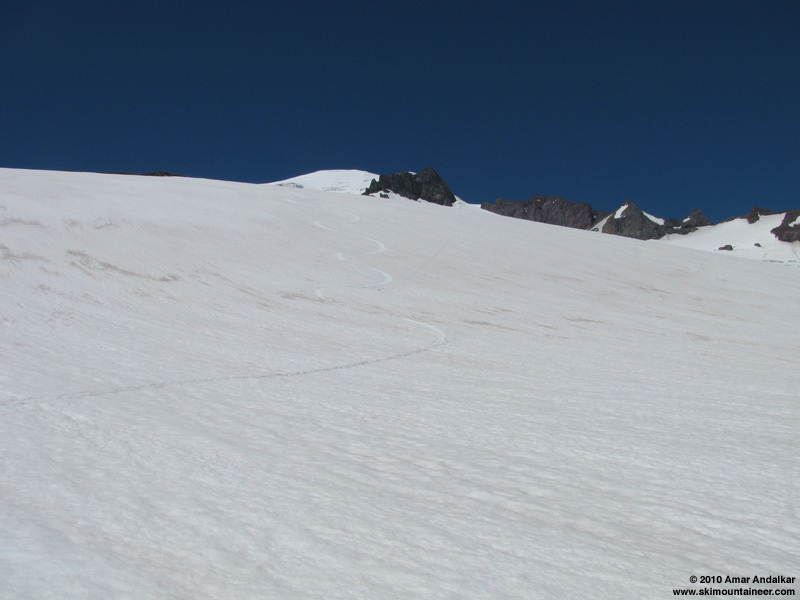 Then past the still-buried Stevens-Van Trump Monument at 6050 ft and straight north up the drainage towards Paradise Glacier, then up the Glacier to join Muir Snowfield at 9000 ft. A few thin cracks are starting to open on Paradise Glacier, but nothing worrisome yet. Looking up the upper Paradise River valley from the Stevens-Van Trump Monument at 6050 ft. Saw a solo skier heading downhill on light touring skis near the monument, then enjoyed complete solitude for the next 2 hours until joining the Snowfield. 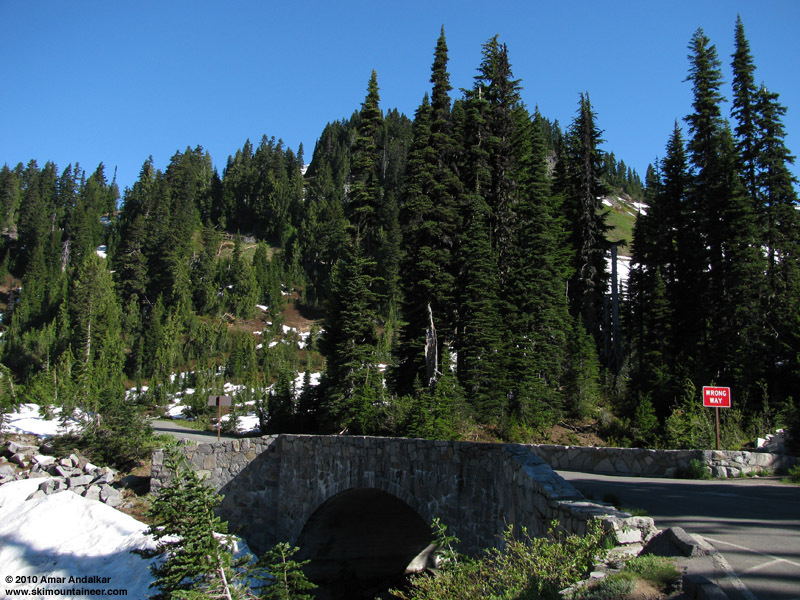 Continued past the busy scene at Muir and on up Cowlitz Cleaver to 10500 ft atop AAA Gully just after 1pm. The day was gloriously sunny, warm but not too hot, and despite a forecast for moderate winds there was only a hint of breeze. Ski tracks in AAA Gully dropping off Cowlitz Cleaver. Dropped down the steep gully at 1:30pm, surely about 2 hours too late, but you take what you can get. Snow was nice enough, oversoftened but still fun. 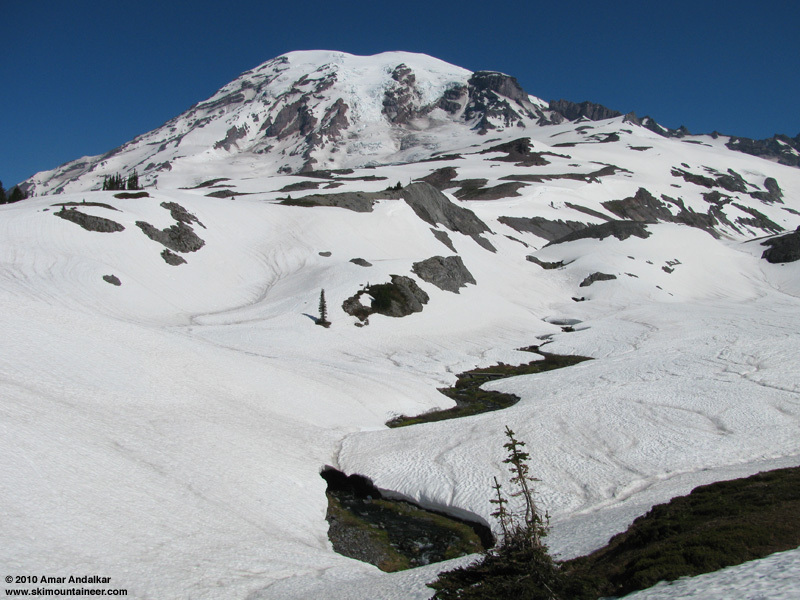 Traversed across the boot pack to the east side of the Snowfield, which still held mostly smooth corn. Dropped past Anvil Rock onto Paradise Glacier, and enjoyed several long sections of really nice corn, interspersed with a few overly soft areas and a few patches of very grippy snow. Overall, snow conditions on the Glacier are becoming well-consolidated and summerlike, since there was no bottomless mush even at 2pm. Big GS turns in nice corn on the Paradise Glacier. Below the Glacier, the long traverse back to Mazama Ridge was not too bad either, travel was easy and fast on the consolidated snow with only moderate suncups and runnels below about 6500 ft, nothing too bad yet. Skied the trail back to the car by 2:30pm. 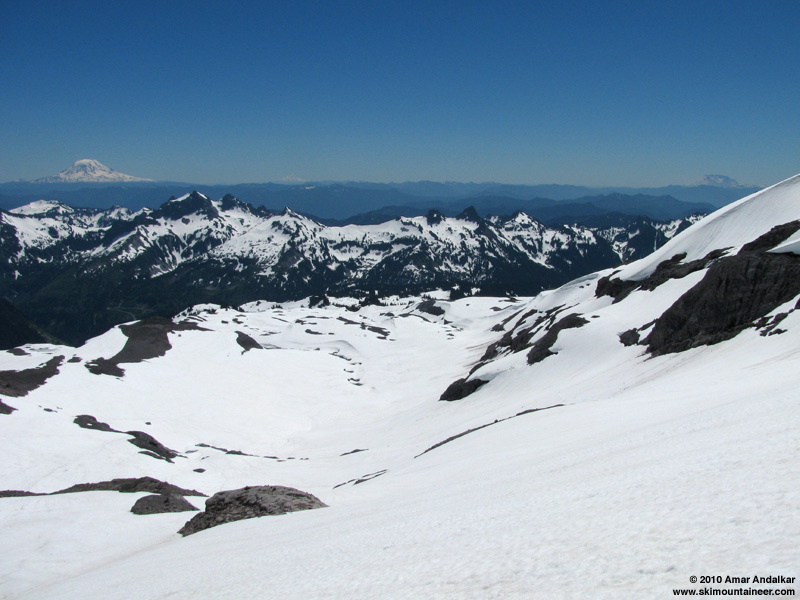 Looking down the final slope of Paradise Glacier, with Mounts Adams, Hood, and Saint Helens in the distance. A nice sweet and relaxed day, 5300 ft of gain for 5300 vert of skiing. Totally awesome to still get a 100% ratio of turns on the Joy-0-Meter in mid-July. And after carrying skis and boots on the pack for the last several trips (every trip in July so far), it was SO NICE to skin right from the car once again. The Mountain delivers as usual! SYNOPSIS...WESTERLY FLOW WILL PERSIST ACROSS THE AREA THROUGH THIS WEEKEND. A WEAK...LOW PRESSURE SYSTEM WILL MOVE ACROSS THE AREA SATURDAY AFTERNOON...FOLLOWED BY A SLIGHTLY STRONGER ONE ON SUNDAY. THE MAIN IMPACT THESE SYSTEMS WILL HAVE ON OUR WEATHER WILL BE TO DEEPEN THE MARINE LAYER FOR MORE CLOUDS OR FOG ALONG THE LOWER SLOPES. TODAY AND TONIGHT...MOSTLY CLEAR. FREEZING LEVEL 14000 FEET. SATURDAY AND SATURDAY NIGHT...MOSTLY CLEAR. FREEZING LEVEL 13500 FEET. SUNDAY...PARTLY SUNNY. FREEZING LEVEL 13000 FEET. SUNDAY NIGHT...PARTLY CLOUDY. FREEZING LEVEL 13000 FEET. MONDAY...PARTLY SUNNY. FREEZING LEVEL 12000 FEET. MONDAY NIGHT...PARTLY CLOUDY. FREEZING LEVEL 11500 FEET. TUESDAY THROUGH WEDNESDAY...PARTLY CLOUDY. A CHANCE OF AFTERNOON AND EVENING SHOWERS. SNOW LEVEL 10000 FEET. WEDNESDAY NIGHT...PARTLY CLOUDY WITH A CHANCE OF SHOWERS. SNOW LEVEL 9000 FEET. THURSDAY...PARTLY SUNNY WITH A CHANCE OF SHOWERS. SNOW LEVEL 8500 FEET. Nice, Amar! We were looking wistfully at the Paradise yesterday - but dangit, you just can't be everywhere at once! Anything opening up on the PG? Thanks for sharing your report, it looked great and surprisingly filled in all the way back to the car. Thanks for the report Amar! Read your report at 10:00am left the car a little before 2:00 and skied down around 6:00. Fine report as usual Amar. Took this suggestion to heart Sunday. Drizzle most of the drive down this morning but sun started peeking out at Longmire. Fully out at TH. Continuous snow still holding out for today. Had to take about 10 steps off the road before snow. This may just make the Zap-O-meter threshold. 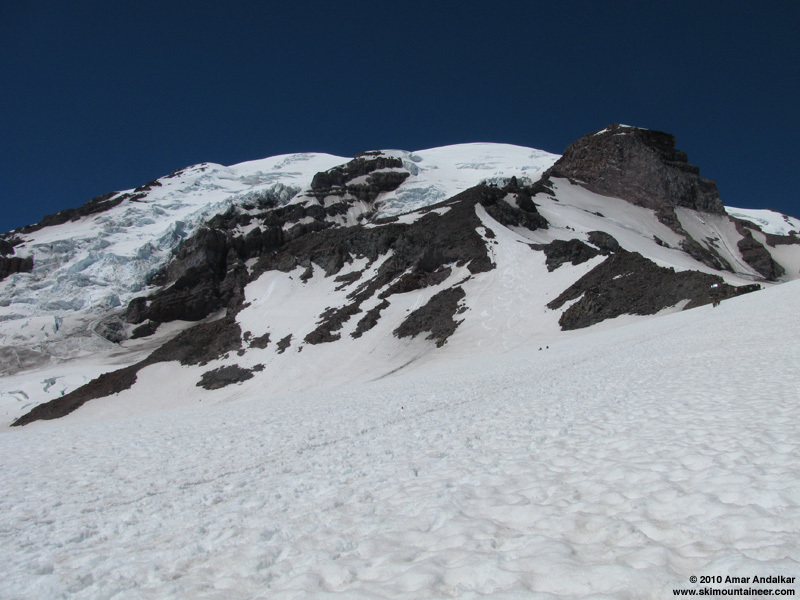 I tried the little ridge separating the upper Paradise GL from Camp Muir. Very pronounced cups and runnels so not recommended. But nice viewpoint away from the hordes. Only saw one other party: John and the UW prof gang. Oh, and the goat. The Tatoosh looked really inviting traversing out. Almost considering the Chute flu for tomorrow! I also took the Paradise glacier today because of Amar's report. Didn't descend that way because I wanted to ski the Nisqually chute, which is still in great condition. I also managed to traverse from alta vista back to my car in Paradise valley completely on snow. Very nice!